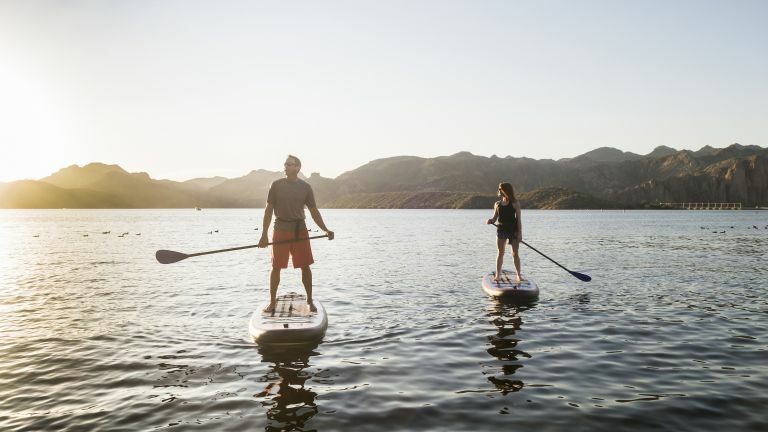 Stand up paddleboarding (also known as SUP) has grown to become one of the most accessible and easy to learn watersports in the world. It only takes a board, a paddle, and a few minutes of instruction to get yourself out on the water. Whether you’re meandering along inner city rivers or exploring countryside waterways, stand up paddleboarding opens up new perspectives on familiar surroundings. It’s also a great way to destress, keep fit and socialise. “If you struggle with swimming or if you feel particularly wobbly, use a buoyancy aid. We encourage people to wear them. Prior board experience is really good, and anyone with a certain level of fitness will already have those ‘stabiliser muscles’. “At Original Wild, we normally start by talking about the important parts of the board, like the handle. The handle is the middle of the board—the balancing point. Wherever you kneel or stand on the board, make sure it’s at the handle. “There are two common errors: the first is that when you stand up, you’ll naturally want to keep your balance, so you’ll tend to lean forwards in that wobbly protective position and look down at your feet. That combination doesn’t work. “In England, only 13 percent of rivers are paddle-able, compared to Scotland where it’s 100 percent,” says Kyle. “That’s a real shame. There are a lot of tie-ups with fishermen and land owners, so be careful. They may not own the river, but they own the place you’re getting on from. “When you buy a SUP you can get a complete package: a pump, bag, board, leash and paddle. Quroc does a 10’4” Qi Crossover iSUP package, including a Pure Carbon V Blade paddle. “One of the dangers with paddleboarding is that, because you’re stood up, you’re like a huge sail. If it’s really windy it can be quite dangerous, especially if you’re near weirs or big open areas. And if you’re in the middle of a lake and it’s gale force winds, you’ll have a hard time. Although many SUP boards include a paddle as part of the package, you might want to choose your own. If so, Kyle has an expert recommendation here too: “Red Paddle Co paddles, like the Ultimate Carbon, are really nice. “Fully waterproof with no need for an extra casing that fogs the lens. We use the GoPro for all our watersports and it’s never let us down. “The Garmin Fenix 5 has a great stand up paddleboarding app, and makes a good all-round sports watch that enables you to track your paddleboarding journey. Visit Original Wild for more information on the stand up paddleboarding tours, taster sessions and safaris available, in addition to canoeing, kayaking, climbing and mountain walking experiences.